LANCASTER/PALMDALE – The Los Angeles County Sheriff’s Department is calling on residents to share the joy of the season, by helping to make the holidays brighter for tens of thousands of children in need. The Sheriff’s department is asking each resident to drop off a new unwrapped $10 toy to a local Sheriff’s Station. The new toys are given to children who attend schools adopted by the local sheriff’s stations and to the children of members of the United States Armed Forces serving our country overseas. The toys need to be new and unwrapped, with a value of at least $10, and appropriate for children between the ages of 1 and 16. 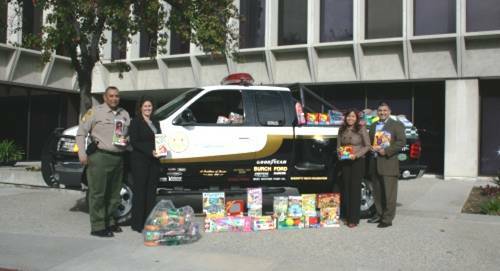 Toys can be left in any of the gift-wrapped bins located in the lobby of every patrol station of the Los Angeles County Sheriff’s Department, 24-hours a day, 7 days a week. Donations should be made prior to Saturday, Dec. 17 so the department can get them to the kids in time, but they will gladly accept toys right up to Christmas Eve (Dec. 24). For the past two years, thanks to the generosity of many people, the Sheriff’s Department has collected nearly 70,000 toys, all given away to kids in need. To join the Sheriff’s Department in providing special memories to kids during the holidays, donate new unwrapped toys today by visiting the Lancaster station, at 501 W. Lancaster Blvd. or the Palmdale Station, at 750 East Avenue Q.